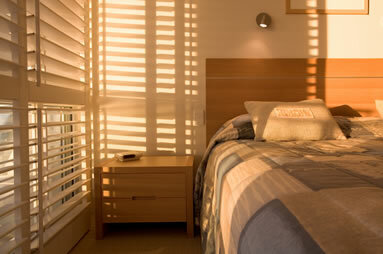 Your shutters are supplied with a surrounding frame usually on 3 or 4 sides. If you have a deep enough recess you can choose an inside mount for your shutters. 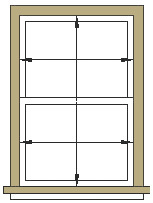 An L frame mounted inside the reveal with be fixed beside the window while a Z frame will be fixed at the front of the recess to give an architrave effect. Using a steel measuring tape, measure the width in three places; top, middle and bottom and record the smallest width down to the nearest millimetre. We recommend you deduct 4-5mm from the opening width to allow frame to fit within the reveal. Always measure at the points where the frame is going to be fitted. For example if you decide to use a Z frame, measure out at the front of the reveal, not in next the window. Measure in three places; left, centre and right and record the smallest height. We recommend you deduct 2-3mm from the opening height to allow frame to fit within the reveal. If mounting inside the reveal using an L frame, look out for protruding handles on PVC windows which might obstruct the tilting louvers, or alarm boxes etc which may obstruct the fitting of the frame. Also if you have tilt and turn windows you will not be able to use the inside mount option as the window will be obstructed by the frame. In this instance you must use the outside mount frame for fitting onto the face of your wall.